Many patterns call for using half width floral tape to wrap the stems. 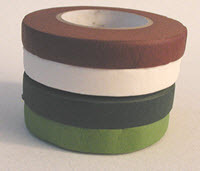 Floral Tape usually comes in 90 foot rolls of one-half inch wide tape. Half-width means you cut the tape in half lengthwise so that you wrap with one-quarter inch wide floral tape. This reduces bulk and lumpiness of the stem. Be sure to stretch the tape before wrapping as stretching produces the waxy stickness that makes the tape adhere to itself and to the stem. Floral tape was invented during World War I. The product used for stem wrapping had been Florist Parafilm which is still sold. Parafilm contained a rubber compound which was need during the war and could no longer be used. At that point someone in research, it's not know who, came up with the idea of a paper that stretched covered with wax. Thus, Floratape, a brand name of floral tape, was born.